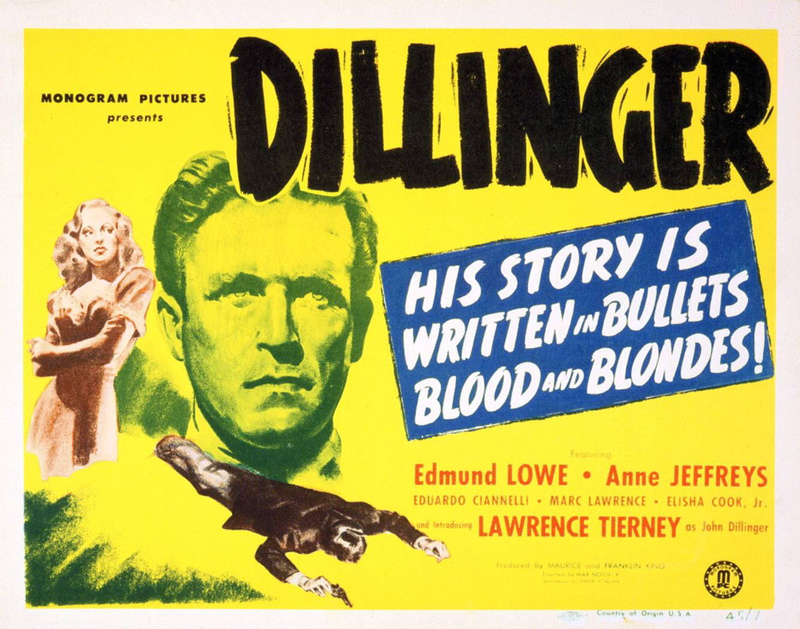 Poverty Row Monogram Studios found themselves with a huge hit on their hands when they released DILLINGER, making a star out of an obscure actor named Lawrence Tierney in the process. This King Brothers production brought the gangster movie back in big way, with Tierney’s ferocious performance turning him into a film noir icon. DILLINGER burst the Kings out of the B-movie bracket, and gave the little studio its first major Oscar nomination for Best Screenplay. 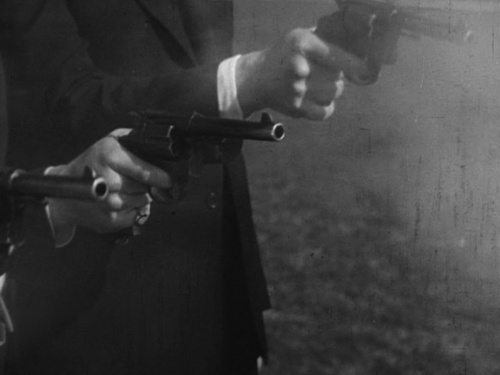 The saga of bank robber John Dillinger should be familiar to most of you through its myriad film portrayals, so let’s skip the story and go straight to Tierney. 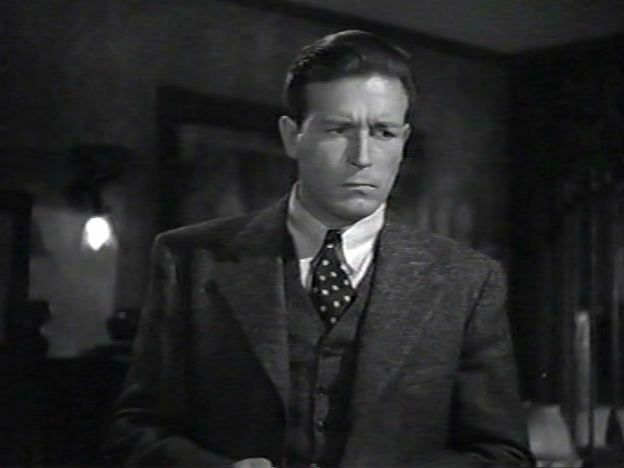 Though the film bills him as “Introducing Lawrence Tierney”, the RKO contract player had been in films a couple years playing bit parts in movies like GHOST SHIP and BACK TO BATAAN when his home studio loaned him out to the Kings. The New York-born actor took the part and ran away with it, making Dillinger an animalistic, ruthless psychopath who lets no one and nothing stand in his way. Tierney’s bone-chillingly scary throughout, whether slicing up a waiter who once slighted him with a broken beer mug, or picking up an axe when he spies one of his mob trying to take it on the lam. Most of the violence takes place offscreen, but Tierney’s brutish presence leaves the viewer no doubt he’s going to go through with it. After he’s captured once, Tierney utters the immortal line, “No tank town jail can hold me, I’ll be out before the month”, and you believe him. Cold, cruel, and calculating, Lawrence Tierney’s John Dillinger sits high in the pantheon of great movie villains. Tierney’s surrounded by a great supporting cast, rare for a Monogram picture. Anne Jeffreys also came over from RKO to play Helen, Dillinger’s moll and the infamous ‘Lady in Red’ (in fact, the whole movie has that RKO noir feel to it). Miss Jeffreys, usually associated with lighter fare, here is as hard-boiled a dame as there is, and was a good pairing with Tierney. I’m happy to report the future star of TV’s TOPPER is still alve and well at age 93, one of the last of the old-time greats still around with us (oh, how I’d love to interview her!). Dillinger’s gang of crooks consists of rock-solid veterans, chief among them Edmond Lowe as Specs, Dillinger’s cell mate and crime mentor who gets a bullet in the gut when his betrayal is discovered. Eduardo Ciannelli takes the role of Marco, acne-scarred Marc Lawrence is Doc, and everybody’s favorite slimeball Elisha Cook Jr. rounds out the crew as Kirk. Other Familiar Faces are Victor Kilian, Ralph Lewis, Lou Lubin , George McKay, Dewey Robinson, Ludwig Stossel, Ernest Whitman, and Constance Worth. This being a Monogram movie, budget cuts are expected. 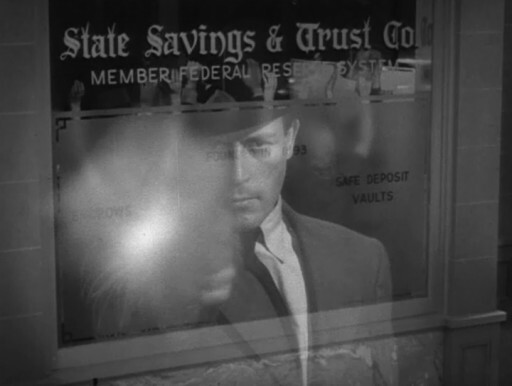 The robbery scene, where the gang uses smoke bombs to heist an armored car, was lifted from Fritz Lang’s 1937 YOU ONLY LIVE ONCE (again, that RKO connection). Footage from Walt Disney’s Mickey Mouse cartoon GALLOPIN’ ROMANCE also appears when Dillinger and Helen make their ill-fated visit to the Biograph Theater, as does audio from MGM’s MANHATTAN MELODRAMA, the actual film Dillinger went to see before his demise. Director Max Nosseck was one of the many German refugees plying their trade in Hollywood, and he keeps things economical, aided immensely by Cinematographer Jackson Rose. Nosseck would again direct Tierney in a pair of tough films, THE HOODLUM and KILL OR BE KILLED. Philip Yordan’s uncompromising screenplay was Oscar nominated, but lost out to an obscure Swiss film I’ve never even heard of titled MARIE-LOUISE. Yordan felt he should have won, and I don’t blame him. His compact, concrete-hard script is raw and edgy, a blueprint for gangster and noir films to come. I suppose Monogram chief Steve Broidy was just happy to be mentioned in the conversation with the larger studios, and Yordan would finally get his due in 1954 for the Western BROKEN LANCE. He had uncredited help on DILLINGER from his friend, director William Castle, for whom he’d written the excellent “B” WHEN STRANGERS MARRY. Philip Yordan’s resume includes ANNA LUCASTA, DETECTIVE STORY, JOHNNY GUITAR, THE HARDER THEY FALL (Bogart’s last film), DAY OF THE TRIFFIDS, KING OF KINGS, BATTLE OF THE BULGE, and CAPTAIN APACHE among many, many others. There seems to be a debate among film buffs (like with PHANTOM LADY ) about whether DILLINGER classifies as film noir or is strictly in the gangster category. I fall squarely in the noir camp, as it has all the elements of a classic noir: the protagonist heading toward a downward spiral, the femme fatale who betrays him, shadowy cinematography, hard-bitten dialog, and sudden outbursts of unexpected violence. No matter which side you’re on, I can assure you DILLINGER is a classic example of how to make a low-budget film work that you’ll enjoy watching over and over again. I love Tierney with his ferocious charisma.